Barracuda is a San Francisco brand, looking to achieve its Kickstarter campaign goal with an amazing product that is changing the luggage business. Barracuda’s distinctive design comes with exclusive benefits to enhance all your trips, its bonus features make your travel time easier. It’s a one-of-a-kind suitcase that reflects the needs and desires of the modern traveler. Barracuda is a groundbreaking carry-on that combines a singular design with unique and practical features, collapsible hard side luggage with GPS, adjustable tray, USB power and ergonomic handle. Collapsible– store your luggage when you’re not using it, especially if you don’t have too much space. The Barracuda collapses and folds into hard-side estate. Adjustable tray– built in, height adjustable tray to place your laptop down in a safe place. 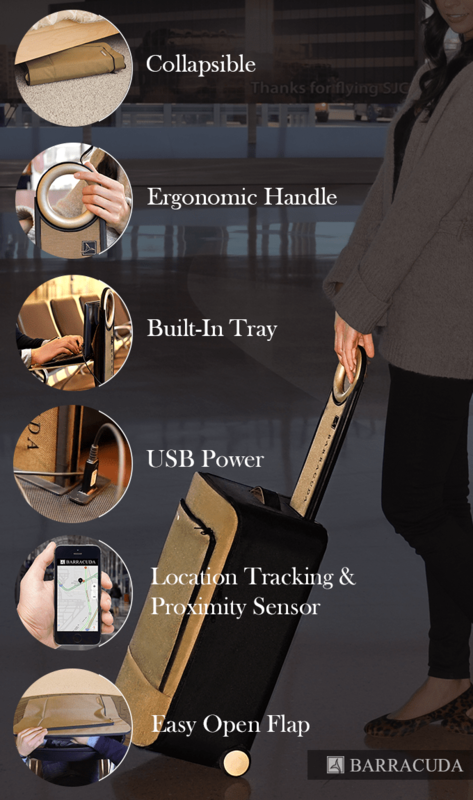 Location & Proximity Sensors– GSM-GPRS technology for location tracking, low battery Bluetooth allowing you to track your Barracuda when in range without crowding around the baggage carousel. Barracuda available colors are: blue, red, grey and gold. The estimated time of delivery is November of 2015. Visit the Kickstarter page to pledge for your Barracuda now. I can’t wait to get my hands on a Barracuda.